GLAND, Switzerland, February 2, 2017 (ENS) – Ten new Wetlands of International Importance in five countries have been designated to celebrate World Wetlands Day 2017, observed every year on February 2. World Wetlands Day marks the date in 1971 when the Convention on Wetlands, known as the Ramsar Convention, was adopted in the Iranian city of Ramsar on the shore of the Caspian Sea. “Wetlands for Disaster Risk Reduction” is the theme of World Wetlands Day 2017, and more than 1,000 events of all kinds are happening around the world today to raise awareness of how healthy wetlands reduce the risk of natural disasters. Intact wetlands can absorb the impacts of floods, droughts and cyclones on communities, and help to build the resilience to withstand these extreme events. They help alleviate food insecurity, reduce poverty, combat climate change, and restore and promote the sustainable use of ecosystems. But around the world, wetlands are being lost to agriculture, urbanization, commercial and residential development, road construction, impoundment, resource extraction, industrial siting, dredge disposal and mosquito control. Pollutants that degrade wetlands include: sediment, nutrients, pesticides, salinity and heavy metals. By 2050, loss of wetlands, increasing populations, the changing climate and rising sea levels are forecast to increase the number of people vulnerable to floods to two billion. In addition, the frequency of natural disasters worldwide has more than doubled in the past 35 years and climate change is expected to increase disaster frequency and severity. Experts estimate that 90 percent of natural hazards are water related, so wetland conservation is essential for reducing these risks. There are now 2,280 Ramsar sites protecting more than 215.27 million hectares in the 169 Parties to the Ramsar Convention. The island nation of Madagascar, off Africa’s southeast coast, has designated five large Ramsar sites to mark World Wetlands Day 2017. The country now has 15 sites, which support the protection of over 1.5 million hectares of habitats critical to the island’s unique biodiversity, achieved with the support of WWF Madagascar. 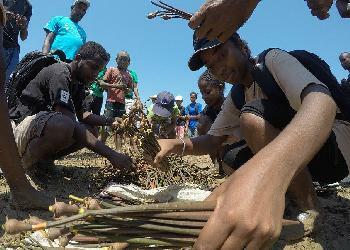 Working with WWF, young people have been planting mangroves, small trees that thrive in the saline water along shores, rivers, and estuaries. The dense root systems of mangrove forests trap sediments that flow off the land, helping to stabilize the coastline and prevent erosion from waves and storms. 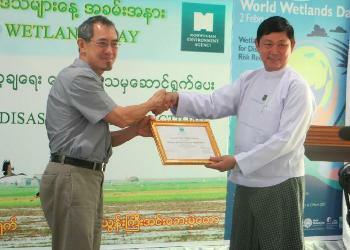 “We have chosen mangrove restoration to slow the degradation of the wetlands of Menabe. We want to support the development of our region through mangroves,” says Tivaindrainy Aristide, conservation officer of the Mahery Youth Consortium. 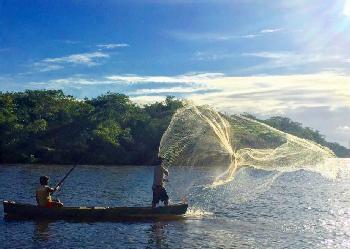 The world has lost 20 percent of its mangrove forests since 1980, according to experts with the Ramsar Convention. In southeast Asia, Myanmar has designated the Meinmahla Kyun Wildlife Sanctuary, a coastal wetland in the southern part of the Irrawaddy Delta, which is also an ASEAN Heritage Park. It supports one of the largest remaining mangrove areas in the delta, where mangroves have declined due to logging, fishing and development of shipping lanes. There are an estimated 30 imperiled Irrawaddy dolphins in the rivers and creeks around the sanctuary. France has designated Marais Breton, Baie de Bourgneuf, Ile de Noirmoutier et Forêt de Monts as a new Ramsar site. This 56,000 hectare site of coastal marshes and tidal bays on the French Atlantic coast is France’s 45th Ramsar site. Italy has designated Trappola Marshland – Ombrone River Mouth as its 53rd Ramsar site. Located on the Tyrrhenian coast of Tuscany, this is one of the last remnants of a partly salty and partly freshwater complex of wetlands and sandy dunes. Ukraine has designated two new Wetlands of International Importance, Byle Lake and Koza Berezyna Mire and Archipelago Velyki and Mali Kuchugury. Byle Lake and Koza Berezyna Mire are located in southwestern Ukraine between the Stokhid, Prypiat and Styr rivers. This site includes a bog, one of the biggest karst lakes in the region, swamp forests, pine woods and a small channelled river. More than 900 native plant species and 500 animal species have been seen there. This wetland complex helps maintain hydrological regimes of the region, in addition to providing carbon storage and climate regulation. Archipelago Velyki and Mali Kuchugury is an string of sandbank islands and shallows in the upper reaches of the Kakhovka Reservoir in the floodplain of the Lower Dnieper River in south-eastern Ukraine where fish breed and grow. The wetland is of great importance as a natural filter of fresh water in the reservoir. 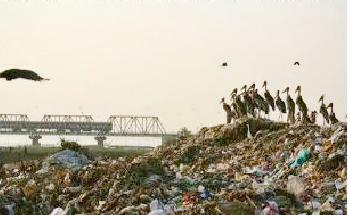 Fights can develop over the degradation of existing Wetlands of International Importance, as is happening now in India. The Sundarbans National Park in India, and the neighboring Sundarbans in Bangladesh together account for the world’s largest area of protected mangroves. But the nonprofit South Asia Network on Dams, Rivers and People warns that India’s 26 Ramsar sites are being degraded and lack protection. Suggesting a complete revision of new wetland rules, activists in Assam have opposed the proposed Draft Wetlands (Conservation and Management) Rules of 2016. Comparing the revised Draft with the Wetland Rules of 2010, they have found that the new Wetland Rules offer limited protective measures for Assam’s wetlands. In Eastern Europe, WWF is warning that hydropower projects and government decisions in ecologically sensitive areas threaten to harm the wetland habitats of rare and endangered species along the Danube river, particularly in Slovakia, Romania, Bulgaria and Ukraine. Small hydropower plants may now be built in protected Natura 2000 sites in Slovakia. A hydropower plant project in Romania endangers Defileul Jiului National Park, a protected Natura 2000 area, while in Ukraine and Bulgaria current hydropower policies are not able to ensure strong wildlife protection. In Bulgaria, the Ministry of Environment is postponing decisions regarding protection of rivers and wetlands from hydropower plant construction. In September, fishing clubs and WWF-Bulgaria appealed “an improperly issued permit” for hydropower plant project across Cherni Iskar and Gorna Perka in Rila Mountain, which WWF says will be devastating for the river ecosystems and their biodiversity. Four months later, after the legal deadline, there is no response from the Ministry of Environment. Non-coordinated construction plans could negatively affect clean water, fisheries and tourism, among others. WWF calls for stronger control over ongoing hydropower projects and efficient policy changes for nature protection. The protection of wetlands of international importance has become a priority for the African country of Gabon, a member of the Ramsar Convention. Nine natural sites in Gabon, encompassing 2.8 million hectares and home to a wide variety of aquatic ecosystems, are on the Ramsar List. The goal of the Sustainable Management of Critical Wetlands Ecosystems Project, financed by the Global Environment Facility, a partnership of 18 agencies including the World Bank, is to enhance the protection of biodiversity in selected forested wetlands on the Ramsar List. It will cover three of the nine Ramsar sites, or 75% of the total area of the Ramsar sites in Gabon. This is being accomplished by expanding the knowledge and expertise of the Gabon’s National Agency of National Parks and developing conservation measures for sustainably managing and preserving these wetland ecosystems.